Q: Many specifications are designated in orders. It is practically impossible to register BOM in all product variations. Is there a good way to solve this problem? A: The user of the Advanced Planning and Scheduling System may have several million variations in one product as determined by the specifications. 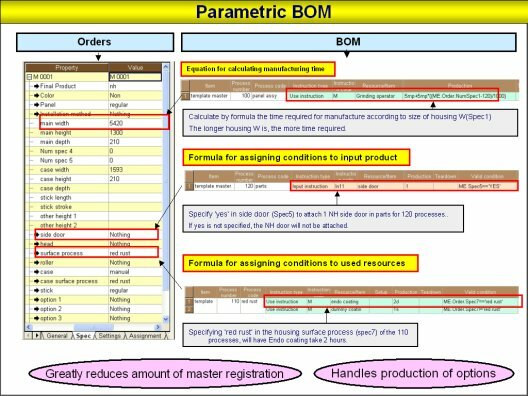 If you use the method known as Parametric BOM you can handle those several million variations with BOM registration. In the example in the diagram above, multiple specifications have been added to "Body W." An expression has been programmed on the BOM side. In the example, "Body W" shows the width of the side. The time differences for panel attachment that are in compliance with that side-width are shown.